Since its inception in 1997, the fifth-generation Chevrolet Corvette had created a remarkable string of performance achievements, on the road and on the racetrack. For 2004, the final chapter in the C5 era, this tradition continued with the Commemorative Edition Corvette, celebrating Corvette Racing's historic Le Mans victories and delivering technology that once again improved the breed. The 2004 Commemorative Edition Z06 features a new hood using carbon fiber material, and exterior graphics and color designed in concert with the new-look C5-R that will go for a landmark third consecutive Le Mans GTS class championship. The carbon fiber hood represents the first time this advanced material has been used as original equipment for a painted exterior panel on a North American-produced vehicle. The unique Le Mans Blue paint with a silver and red center graphic will appear on the race car only at Le Mans 2003 and only on the road on a limited number of 2004 Commemorative Edition Z06s. 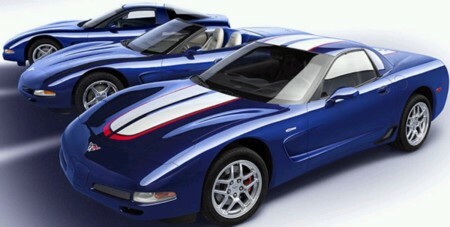 Commemorative Edition Corvette Coupes and Convertibles will also be available for 2004. These will share an exclusive package of styling amenities, including Le Mans Blue paint and a Shale-colored interior, with a Commemorative Edition exterior badge noting Corvette's Le Mans titles. Special embroidery on the headrests of each seat is also included. 2004 was also the 6th time the Corvette paced the Indy 500.